New Delhi/ Pradeep /DDDirectDTH Blog: The CWG 2014 going to be held in Glasgow and this Sport feed will be telecast on Ten Sport channel. But some Indian events would be share with Prasar Bharati. This sports event would be carrying on the terrestrial network to ensure that viewers who do not have access to cable or DTH services can also enjoy the games events. Doordarshan Prasar bharati added a new channel at place of DD Vyas in DD Freedish. 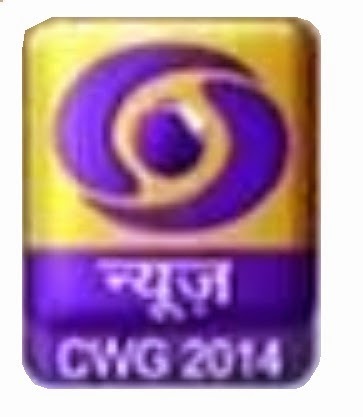 The channel name is DD News CWG 2014, which would be exclusive channel only for CWG Highlights and Live coverage. All India Radio will broadcast live commentary of the opening and closing events of CWG 2014. According to I&B Ministry, The DD News channel has reach about 2.8 million viewership, DD News channel also available in some states by terrestrial network. According to Times of India the online News portal I&B secretary Bimal Julka said, "We have recommended to Prasar Bharati to show the games on DD News. The board was of the opinion that it would be a loss of revenue if sports are telecast on DD National." He also said that the primary news bulletins in the morning, after-noon and evening time will not be disturbed, unless there is some sporting event involving Indians. By this move of Prasar Bharati DD National programs and revenue will not be affected and viewers will enjoy CWG events by DD News CWG2014 TV Channel.